Tonight we attended a panel at the Lebanon Public Library about local food production, specifically in Linn County, which is where we live and is most well-known for its grass seed production. 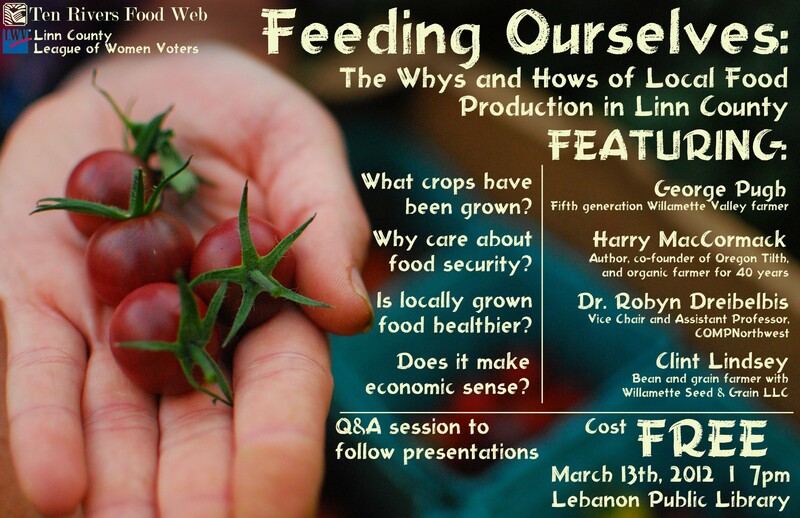 This panel was put on by Linn County League of Women Voters and the Ten Rivers Food Web, a vital resource for local ag. Our good friend Kyle Piispanen already put us on to Ten Rivers and warned us of their awesomeness before we even moved to Oregon. He also let us know about the Wandering Goat Cafe in Eugene, making him 2 for 2. Thanks KyKy. We had a realization today amidst our past couple weeks of both of us working full-time, outside the farm and all of the work needing to be done, that meetings like this are important to keep us energized and motivated for this cause. With the rising cost of fossil fuels, we want to be contributors in a community which gets 30 to 50 percent of its food from local sources. Currently only 1.8% of food consumed in this area is produced locally. WHAT? Looking at certain realities, these sorts of meetings and discussions are positive and necessary to remind us farmers that there is much to be done. We’ve had the experience of talking to young people born and raised in the area who aren’t aware of the Co-Op in Corvallis, which has a very strong presence, while we notice that the Wal-Mart parking lot is always jam packed when we drive by. While it feels at times like it’s out of reach or simply out of scope, supporting local food is worthwhile. It is a good cause that we feel everyone can benefit from. We also want to mention our new friend Harry MacCormack, a speaker on the panel. He co-founded Oregon Tilth and runs a local organic farm outside of Corvallis called Sunbow Farm. Anyway, he’s a leader in the valley when it comes to farming and it’s awesome to receive his big hugs and to hear him mention us and the work we’re doing to a crowd of people.